Independence and everyday practicality in a compact camper van and recreational vehicle: it is a promise the Marco Polo and the Marco Polo ACTIVITY have been living up to since 2015. In January 2017, the product family welcomed a new addition: the Marco Polo HORIZON. The Marco Polo ACTIVITY, based on the Vito, is above all a functional and versatile companion. Featuring an exceptionally variable interior and comfortable sleeping options for up to five people, the Marco Polo ACTIVITY is aimed at young families as well as at sports enthusiasts and outdoor fans looking for a vehicle both for everyday use and for short holidays and outdoor activities. The Marco Polo is based on the V-Class and offers space for four people. It is equipped with a kitchenette, wardrobe, swivelling front seats, a bench/berth and roof bed. The compact camper van is the ideal companion for individualists and savourers who like to use their vehicle for longer trips whilst looking to retain as much independence as possible and enjoy familiar living comfort. They also attach importance to style and appreciate everyday practicality. The Marco Polo HORIZON, based on the V-Class, combines the high-quality design of the Marco Polo with the maximum functionality of the Marco Polo ACTIVITY, thanks to its flexible seating configurations with up to seven seats and sleeping options for up to five people. As such it is the ideal supplement to the portfolio with appeal to additional target groups. At Caravan Salon Düsseldorf 2017, the first edition models of the Marco Polo HORIZON and new optional equipment features celebrate their premiere. From September 2017, Mercedes-Benz Vans will be offering their most style-conscious customers in Europe a special limited edition of the Marco Polo HORIZON, the so called Limited Edition “Designo hyacinth red metallic”. The edition model features the elegant paint colour already familiar from certain Mercedes-Benz passenger car models – including the C-Class and E-Class. However, with the Marco Polo HORIZON it comes as standard in combination with the Night Package. The Night Package further enhances the exterior with black design highlights (for more information on the Night Package, see page 4). Additional extras – including, for example, the AMG Line – are available for the Limited Edition “Designo hyacinth red metallic” on request. The Limited Edition “Designo hyacinth red metallic” in conjunction with the Night Package will also be available for the Marco Polo and the V-Class from September 2017. With the Marco Polo HORIZON EDITION, Mercedes-Benz Vans is launching another edition model of its compact recreational vehicle for the German market, with numerous extras to give it a sporty look, additional functionality and comfort as standard and all at an attractive price of 55,750 Euro (including 19 percent VAT). The Marco Polo HORIZON EDITION will be available from September 2017. The sporty good looks of the Marco Polo HORIZON EDITION are what set it apart from the base model. The Exterior Sports Package, together with metallic paintwork, 17-inch alloy wheels and tinted rear windows, give the vehicle a dynamic appearance. Furthermore, the edition model comes with a separately opening rear window as standard. This makes loading and unloading easier in two respects: on the one hand, it allows a second loading level; on the other – particularly in tight parking spaces – there is no need to open the large liftgate. The Marco Polo HORIZON EDITION also offers increased comfort. 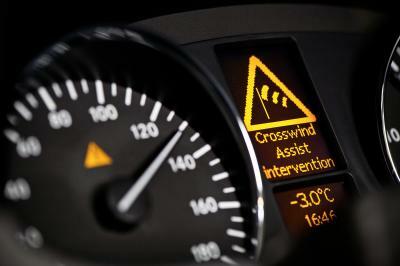 The 7G-TRONIC PLUS automatic transmission ensures that the vehicle handles nicely. The Parking Package with reversing camera and Active Parking Assist makes parking and reversing in tight spaces much easier. TEMPMATIC air-conditioning ensures that a pleasant temperature is always maintained – including in the rear – and infotainment comes from the on-board Audio 20 CD multimedia system featuring intuitive touchpad control. From September 2017, a series of new optional equipment features for the Marco Polo HORIZON and Marco Polo will offer customers even more opportunity to individualise their vehicles with regard to both style and functionality. Night Package, available for the Marco Polo HORIZON and Marco Polo: The Night Package transforms the Marco Polo HORIZON and Marco Polo models into highly distinguished travelling companions thanks to the inclusion of black design highlights such as: high-sheen black 18-inch alloy wheels, obsidian black metallic exterior mirror casings, a radiator trim with black louvres and chrome inserts and black tinted rear windows. A special highlight is the pop-up roof in black. The pop-up roof is also available on request in the same colour as the vehicle. In conjunction with the AVANTGARDE Exterior Sports Package or the AMG Line the front bumper trim is also painted in black. Interior Design Package, available for the Marco Polo HORIZON and Marco Polo: Lugano leather seats in black, or in silk beige as an option in the Marco Polo, give the vehicle interior a particularly luxurious feel. This impression is enhanced by a choice of trim finishes including piano lacquer or wood look. A leather steering wheel and brushed aluminium sports pedals round off the Interior Design Package. Interior Premium Package, available for the Marco Polo HORIZON: Customers opting for the Interior Premium Package for the Marco Polo HORIZON can choose from three colours of high-quality nappa leather: black, in conjunction with a grey roof liner, or either marron or silk beige with a roof liner in porcelain. A leather-covered instrument panel with decorative stitching and ambient lighting in the cockpit and rear complement the high-end interior. New seating configuration, available for the Marco Polo HORIZON: The Marco Polo HORIZON is available with a variety of different seating configurations. Hitherto these have ranged from the standard five-seater with three-seater bench/berth in the rear and two swivelling front seats to the option of a seven-seater with three-seater bench/berth in the second rear row and two additional single seats in the first rear row. These are now supplemented by the new option of four single comfort seats in the rear. 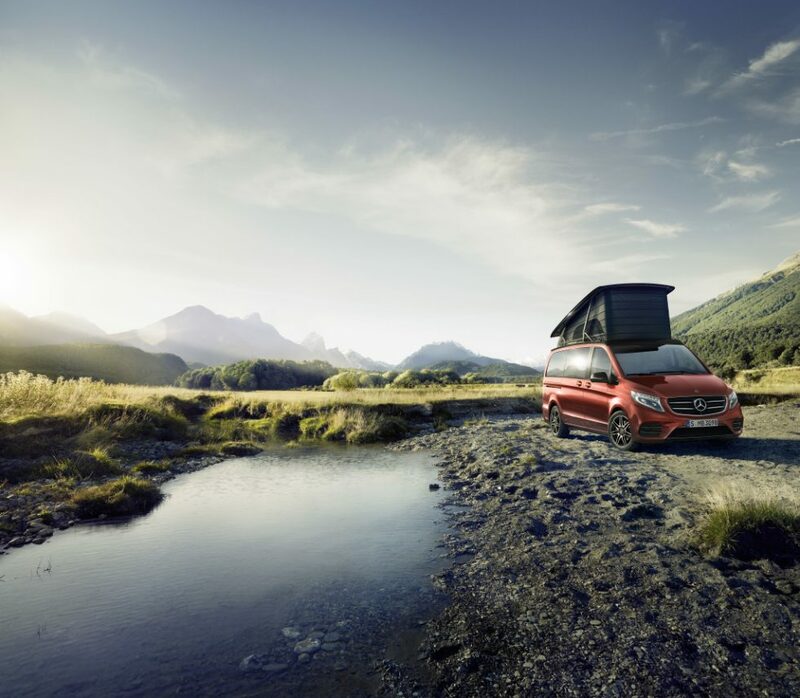 Beyond the extension of the product portfolio in regard to the Marco Polo HORIZON and Marco Polo, Mercedes-Benz Vans also reinforces its camper van expertise in the dealer network and expands its presence in the international camper van market in 2017. In January 2016 Mercedes-Benz Vans introduced a specialist camper van service at selected dealerships. At the end of 2016 there were 57 sites with special Marco Polo expertise in Germany. This year will see the addition of seven more, with plans to roll out the scheme across other European countries. Along with specially trained sales staff – the so called Marco Polo Experts – the specialist dealerships have Marco Polo models in their showrooms for demonstration purposes and test drives. The Marco Polo family also adds its own contribution to the “Mercedes-Benz Vans goes global” growth strategy this year. A right-hand-drive Marco Polo has been launched in Great Britain in May 2017. The Marco Polo ACTIVITY celebrated its market premiere in Australia in June 2017. This is the first time a Marco Polo model from the current model series is available overseas. In an accident scenario defined by TÜV Rhineland in 2015, the Marco Polo was the first camper van to have proven in a crash test, over and beyond the conventional testing regime, how well the occupants are protected from the vehicle’s load as well as the stability of the vehicle’s fitted furniture. In this test, the vehicle structure absorbed all the forces generated in a collision at a speed of 56 km/h without any particular deformation in the interior. The built-in units remained intact and the furniture doors closed. In 2017 the Marco Polo HORIZON and the Marco Polo ACTIVITY have likewise received the “certified occupant protection” test mark from TÜV Rhineland. From the big Sprinter and compact Vito and V-Class to the small Citan, the entire Mercedes-Benz Vans range is a big hit among leading camper van body and conversion specialists. At this year’s Caravan Salon Düsseldorf, Mercedes-Benz Vans is showcasing a Grand Canyon S from the body manufacturer specialist HYMER and an Independent from CS-Reisemobile on its stand, both based on a Sprinter with all-wheel drive. With the Sprinter 4×4 as a platform vehicle these camper vans can cope easily on unsurfaced or snow-covered roads. Moreover, the brand bearing the three-pointed star shows how the Citan can be transformed into a fully fledged camper van in next to no time with a conversion solution featuring a sleeping module/kitchen module from VanEssa. The sleeping module as well as the kitchen module can be fastened to the existing lashing eyelets in the luggage compartment in a matter of minutes – and once the holiday is over, the camper van can just as quickly be converted back into a normal city car for everyday use.